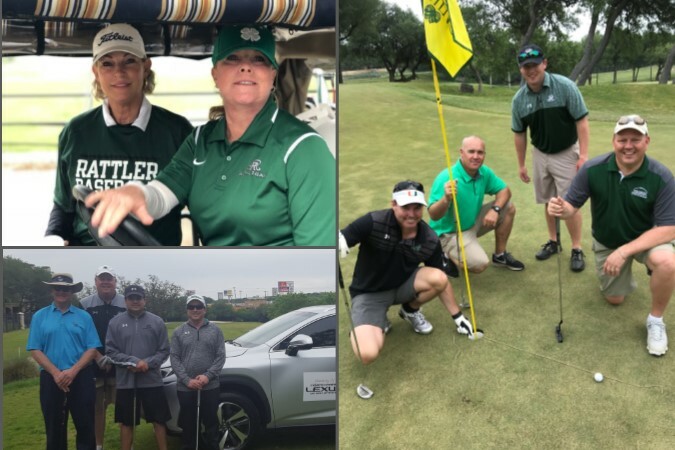 April 14, 2018 – The Diamondbacker Sports Association had a successful golf tournament to benefit all Reagan athletic programs. This past Monday, over 160 golfers played both courses at the beautiful Sonterra Country Club. Even our Superintendent, Dr. Gottardy, was able to get some shots in on the course. Following the tournament, golfers and their guests relaxed on the Sonterra patio while enjoying a delicious dinner, live music by Coach Jamey Howard, and DJ entertainment. Many awards were given for lowest scramble score, longest drive and closest to the pin. Unfortunately, none of our golfers won the sleek Lexus in the Hole-in-One contests. Thank you also to our event Chairpersons on a fabulous event and fundraiser! All proceeds from this event will benefit the Diamondbacker Sports Association, a 501(c)3 charitable organization.